The crane is a traditional origami model which has been folded for hundreds of years. The crane stands for long life and good luck, and some people think that if you fold 1000 cranes you will be granted a wish! Since the Second World War the origami crane has also come to be a symbol for "peace". Read more about origami cranes and Sadako Sasashi here. This model is a little fiddly to fold, so you may have to practice! You will need to fold an origami bird base first (instructions below). 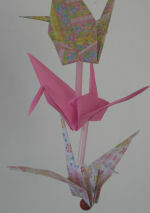 Also included are instructions for making an origami crane mobile - very pretty! This origami (or kirigami) dove is easy to fold, but needs a few simple cuts with a pair of scissors. It makes a very pretty decoration for a table or mantelpiece, looks lovely in a mobile, or hanging on a Christmas tree. We have made ours using a semi-transparent handmade paper. Here is a cute little origami fan to fold for dolls, teddy bears, or just for decoration. And of course you can make it with a bigger piece of paper so that you can use it yourself.